(PRLeap.com) December 2, 2015 - Leading U.S. literacy nonprofit organization, Kids Need to Read (KNTR), and game company, uKloo Kids Inc., are working in partnership to add the uKloo Early Reader Treasure Hunt game to a new national school program that helps children embrace a love of reading. KNTR, a children’s literacy organization founded by children’s author PJ Haarsma, Denise Gary, and actor Nathan Fillion (star of TV’s Castle), adds a playful element to its new READ Together program with the help of uKloo, a multi award-winning literacy game that incorporates a physical activity with reading and problem-solving. The KNTR READ Together Program was developed to bring an array of strategies and assorted reading materials to 72 classrooms at 20 schools located in low socioeconomic areas throughout the USA. By utilizing uKloo games as many as 2,000 children will be given an alternative reading experience though physically active reading play. Denise Gary, Executive Director, KNTR, said, "Games like uKloo are extremely useful in helping children view reading as a joyful experience, possibly affecting their attitude toward reading forever. uKloo is a terrific resource to help inspire children to read at an early age, allowing this vital, lifelong process to begin in a positive manner." 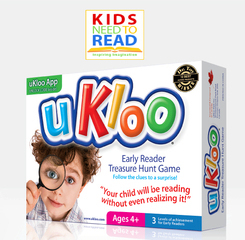 The uKloo Early Reader Treasure Hunt Game (MSRP $15.95 for ages 4 and up) is a fun seek-and-find literacy game that empowers children to be independent readers. Kids are set up to succeed with the help of a "Picture Helper Poster" that offers first research skills through picture clues as they hunt their way to a hidden surprise. Children are so engaged that they begin reading without even realizing it! Doreen Dotto, president of uKloo Kids, Inc. and creator of the uKloo games, said, "It’s a privilege to have our uKloo Early Reader game selected for the READ Together program. uKloo’s partnership with KNTR will give children with various learning styles a fun, proven-effective reading experience. Our partnership will help empower children by developing their early literacy skills so that they can embark on a life-long love of reading." In addition to the uKloo Early Reader, uKloo Kids also offers the uKloo Riddle Edition Treasure Hunt Game (MSRP $17.95 for ages 7 and up) geared to the next stage reader, and a uKloo App for iPhone and iPad that extends uKloo reading vocabulary into new digital environments. The uKloo App is available as a free download on the iTunes Store. uKloo games were created by Dotto, a mom whose two boys avoided reading homework at all costs. With the help of teachers, parents and kids, Dotto designed uKloo games to engage reluctant readers and improve sight reading, reading comprehension, logic, reasoning and problem-solving skills. The games have been tested and approved for learning excellence for children with special needs.